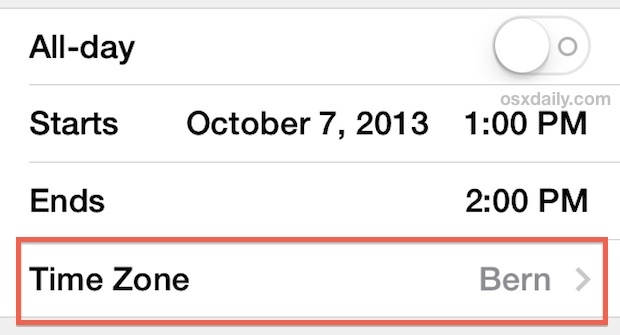 When this setting is off, events will display according to the time zone of the devices current location. With this setting on, the events show according to the time zone that has been chosen in the calendar. It’s important to understand the distinction otherwise you may wind up being even more confused with the setting on, the default setting makes sense for most users while the time zone support is ideal for individuals who frequently cross time zones. Now that the feature has been enabled, you can edit any existing event to set a time zone for it by tapping on the event in question and choosing “Edit” followed by “Time Zone”. Similarly, you can also now set time zones for new events simply by tapping on the “Time Zone” option and selecting the appropriate option. Be sure to keep this setting consistent across all iOS devices that you use with the same Apple ID to prevent any conflicts or oddities with event times and dates. If you travel with a Mac as well, you will probably want to enable the same time zone support in the Calendar app for OS X as well. Assuming both the Mac and iOS devices are using the same Apple ID and iCloud setup, the dates and times will sync properly to and from the devices. You have certainly written a clear article. Unless I missed something, I still do not see an easy way to enter many airline flight schedules. Airline schedules always use the time zone of the departure location for the departure time. And they use the time zone of the arrival location for the arrival time. So, if you think about it, just as the flight itself starts in one time zone, then ends (sometimes) in another time zone, the flight event entered in the calendar should also be able to have a different time zone for the start and end times. Not that this can apply to other events as well, not just airplane rides. 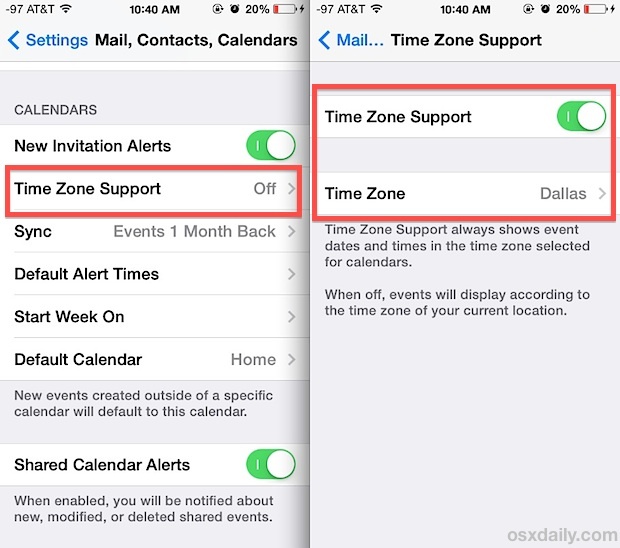 Do you know of any solution for the iPhone of Macintosh calendars that permit specifying different time zones for the start and end of an event.